Not too far from the Great Pyramids of Giza is the $1 billion Grand Egyptian Museum. The new museum will house 100,000 artifacts – from Egypt’s prehistoric times to its Greek and Roman eras – making it the largest museum in the world dedicated to the heritage of a single civilization. 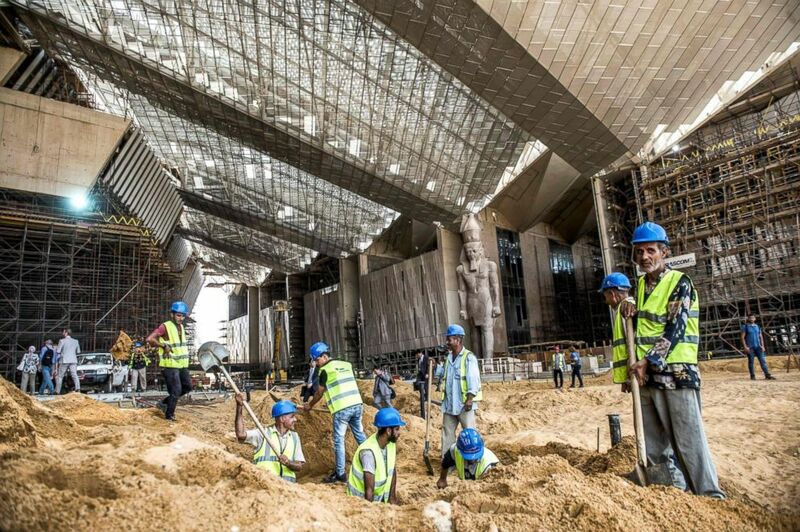 Almost 6,000 workers are involved in the construction of the museum on a daily basis, ahead of a scheduled soft opening in early 2019. 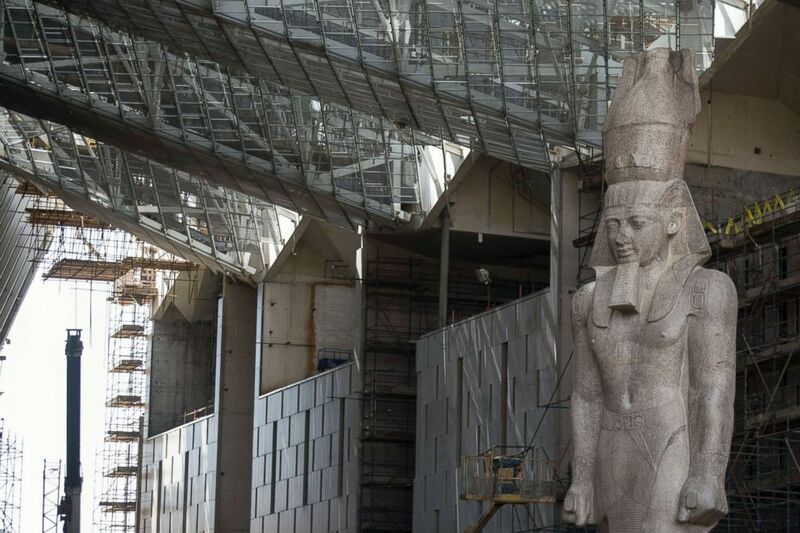 The colossus of Pharaoh King Ramses II is seen at it's permanent display spot inside the Grand Egyptian Museum, in Giza, Egypt, April 26, 2018. The GEM is part of a bigger complex that will include an exhibition space, movie theater and other educational, cultural and entertaining facilities that target tourists of all ages. “The GEM is not only for the tourists coming to Egypt. [It also] addresses the young generations of Egyptians so they know about their cultural roots and to raise awareness about heritage among all different ages in Egypt,” Tarek Tawfik, the museum's director general, recently told ABC News. Egyptian construction workers excavate outside the entrance of the Grand Egyptian Museum in Giza during its construction June 10, 2018, with the 3,200-year-old colossal statue of King Ramses II seen in the background. Museum officials hope it will help boost the country’s tourism, which suffered as a result of political turmoil and militant attacks that have targeted tourists. Recent government statistics show that the industry is slowly recovering. “All potentials for tourism boost have been provided,” Tawfik said, explaining that a new charter airport will be opened a short distance away from GEM. A restorer works on Old Egyptian artifacts in the Grand Egyptian Museum, April 26, 2018 in Giza Egypt. 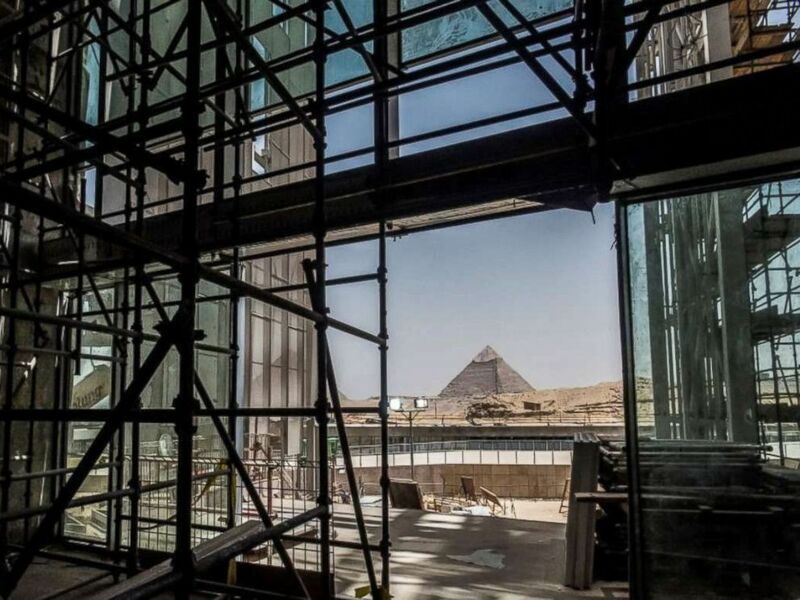 According to Tawfik, more than 15,000 people will indirectly benefit from the museum's grand complex, which is prepared to welcome up to 10,000 visitors a day. A picture taken on June 10, 2018 shows a view of construction work undergoing at the site of the Grand Egyptian Museum in Giza on the southwestern outskirts of the capital Cairo, with the Pyramid of Menkaure seen in the background. One of the museum's highlights is the complete collection of Tutankhamun's tomb, which was discovered in 1922. 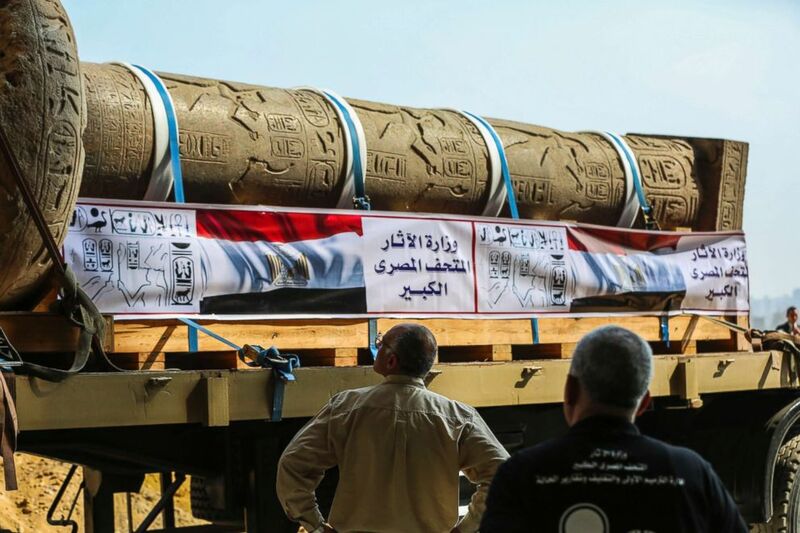 The King Merneptah pillar is loaded onto a truck to be transferred to its permanent display area at the Atrium of the Grand Egyptian Museum (GEM), near the Pyramids of Giza, Egypt, March 10, 2018. Only 1,800 pieces of the collection have previously been on display, according to Tawflik. Now all 5,000 pieces will be available to view. “Tutankhamun will be displayed in a totally new way that will reveal the man behind the gold mask,” he said. Workers unload boxes containing pieces of the last chariot of Tutankhamun at the Grand Egyptian Museum (GEM), Giza, Egypt, May 5, 2018. 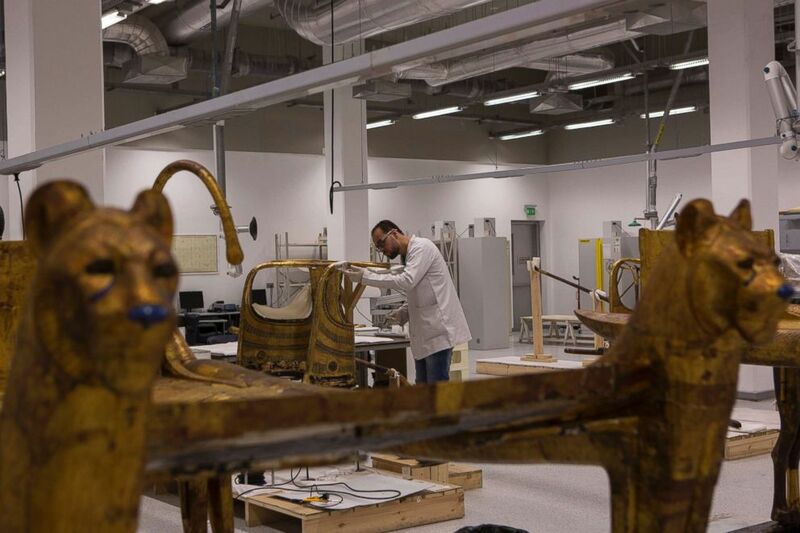 Inside the wooden artifacts lab, conservators are working on Tut’s funerary beds and chariots that have not been restored for almost a century. 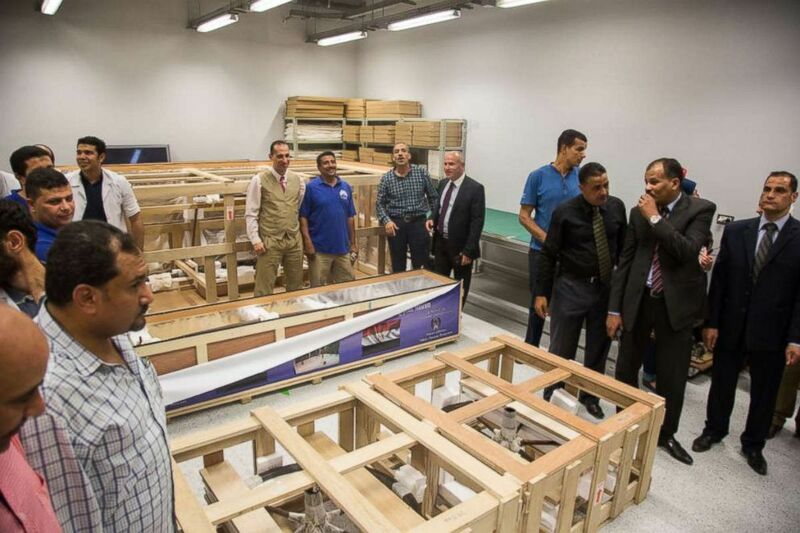 “The facilities and the environment provided at the GEM’s lab do not exist anywhere else in Egypt,” Mohamed Mostafa, one of the conservators, told ABC News. 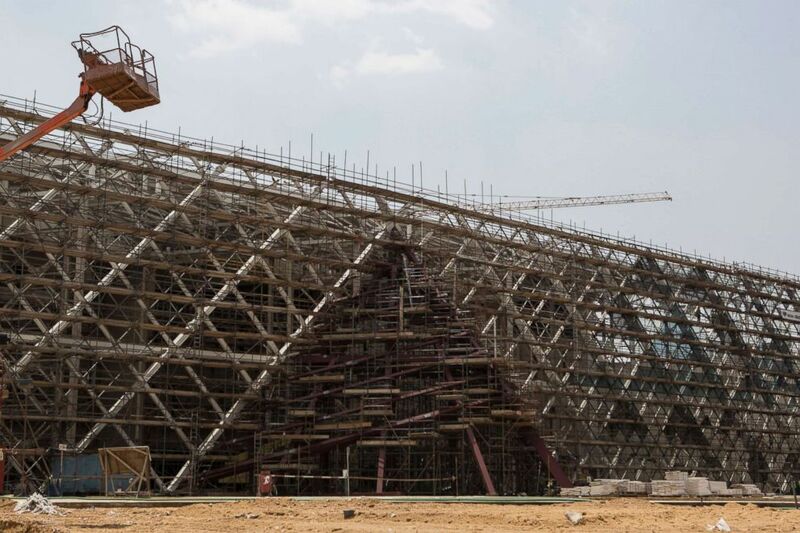 A general view of the facade of the Grand Egyptian Museum, in Giza, Egypt, April 26, 2018. “We are now catching up to international institutes” like the British Museum and the Metropolitan Museum of Art, he added. 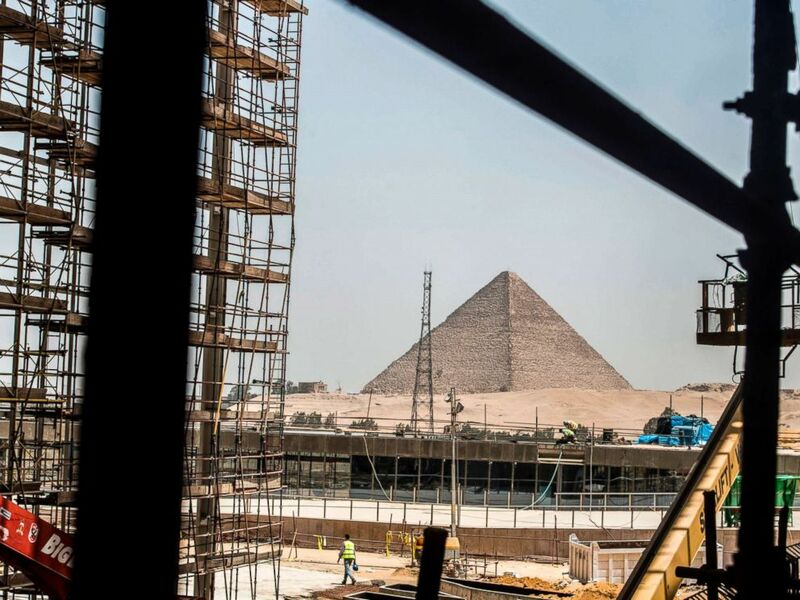 A view of construction work undergoing at the site of the Grand Egyptian Museum in Giza on the southwestern outskirts of the capital Cairo, with the Pyramid of Khafre, also known as Chephren, seen in the background, June 10, 2018.